Carolyn Bennett is expected to announce the deal Friday. Marcia Brown Martel is seen outside court in Toronto on Thursday, Dec. 1, 2016. TORONTO — The federal government has agreed to pay hundreds of millions of dollars to survivors of the '60s Scoop for the harm suffered by Indigenous children who were robbed of their cultural identities by being placed with non-native families, The Canadian Press has learned. The national settlement with an estimated 20,000 victims, to be announced Friday by Crown-Indigenous Relations Minister Carolyn Bennett, is aimed at resolving numerous related lawsuits, most notable among them a successful class action in Ontario. Chief Marcia Brown Martel sits with her husband Raymond Martel at a news conference in Toronto on Feb. 14, 2017 after an Ontario judge ruled Canada failed to take reasonable steps to prevent thousands of on-reserve children who were placed with non-native families from losing their Indigenous heritage during the '60s Scoop. Spokespeople for both Bennett and the plaintiffs would only confirm an announcement was pending Friday, but refused to elaborate. "The (parties) have agreed to work towards a comprehensive resolution and discussions are in progress," Bennett's office said in a statement on Thursday. "As the negotiations are ongoing and confidential, we cannot provide further information at this time." The sources said the government has also agreed to pay the plaintiffs' legal fees — estimated at about $75 million — separately, meaning the full amount of the settlement will go to the victims and the healing centre, to be established in the coming months, sources said. Carolyn Bennett is sworn-in as Canada's Minister of Crown-Indigenous Relations and Northern Affairs during a cabinet shuffle at Rideau Hall in Ottawa on Aug. 28, 2017. In an unprecedented class action begun in 2009, Brown Martel, chief of the Beaverhouse First Nation, maintained the government had been negligent in protecting her and about 16,000 other on-reserve children from the lasting harm they suffered from being alienated from their heritage. However, in February, Ontario Superior Court Justice Edward Belobaba sided with Brown Martel, finding the government liable for the harm the '60s Scoop caused. Belobaba was firm in rejecting the government's arguments that the 1960s were different times and that it had acted with good intentions in line with prevailing standards. Marcia Brown Martel is the lead plaintiff in the Ontario Sixties Scoop class action lawsuit. 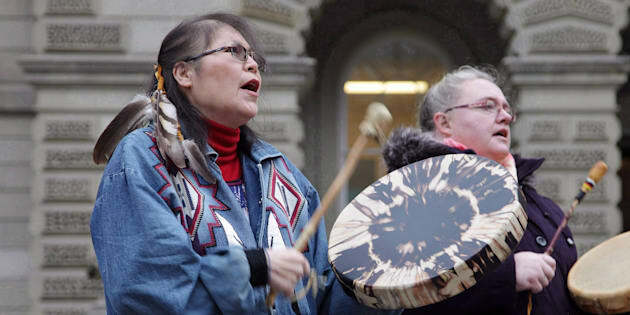 While Bennett said at the time she would not appeal the ruling and hoped for a negotiated settlement with all affected Indigenous children, federal lawyers appeared to be trying to get around Belobaba's ruling. Among other things, they attempted to argue individuals would have to prove damages on a case-by-case basis. One source said some aspects of the many claims might still have to be settled but called Friday's announcement a "significant" step toward resolving the '60s Scoop issue — part of the Liberal government's promise under Prime Minister Justin Trudeau to make reconciliation with Canada's Indigenous people a priority. Jeffery Wilson, one of Brown Martel's lawyers, has previously said the class action was the first anywhere to recognize the importance of a person's cultural heritage and the individual harm caused when it is lost.